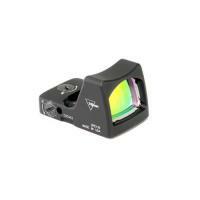 Trijicon RMR Sight (LED) - 6.5 MOA Red Dot FREE SHIPPING! The Trijicon RMR Sight (LED) - 6.5 MOA Red Dot is a tactical device found to be compatible with numerous calibre weapons. The automatic brightness mode awards greater convenience under any circumstance, while the eight adjustable feature settings add a level of versatility superior to other weapon attachments like this. The LED sight on this is powered by one simple CR2032 Lithium battery awarding a full 2 years of standard usage. This tactical gear is more durable and sturdy than competitors, though it is much lighter in weight. This definitely doesn't take away from it's ruggedness and capability to match the strength and power of the ACOG either. Officers will also be pleased with the easy to use features along with the multiple other adjustments that help with precision aiming. Features such as these allow this tough lightweight to surpass industry standards too. The Trijicon RMR sight is also found to be suitable for those within the military and even for those who are simply engaging in hunting expeditions. This makes it more versatile than other units and highly popular among law enforcement personnel. The quick windage feature just adds to the glamour of this smart tactical gear officers and military alike can't do without. ©2002-2019 CopsPlus.com: Trijicon RMR Sight (LED) - 6.5 MOA Red Dot FREE SHIPPING!